November 3, 1863 – While the regular bridge tender at Rush Street is away “peddling copperhead tickets in the Sixteenth Ward,” his replacement manages to break the bridge in two in one of the stranger incidents ever to take place on the river. At 5:00 p.m. a hundred head of cattle are driven onto the bridge which was already occupied by “J. H. Dole, esq., with a horse and buggy, a teamster with a horse and wagon belonging to Mr. C. H. McCormick, a drover, and a young girl, a sister of the drover”. [Chicago Daily Tribune, November 4, 1863] At this point a tug whistles for the bridge to swing on its turntable to allow passage and “the reckless substitute of the tender swung the bridge” away from the banks of the river. Almost immediately the north end of the bridge lifts 20 feet and “there was a snapping of iron, a cracking and crashing of timbers, a shriek of horror from the bystanders, and Rush street bridge, breaking in two across the centre pier, fell into the river, a total ruin.” The young girl was given up for lost after a search that lasted into the evening; everyone else was rescued. About two-thirds of the cattle were either drowned or crushed to death by the falling bridge. The paper’s account of the event ends with a question: “Hasn’t the city had about enough of Mayor Sherman’s bridge tenders … Cannot men be found, even amongst the Copperheads, who are competent to perform the simple duty of managing a turn bridge? Three years ago, there was no trouble at the bridges. Men were appointed then because they were honest, faithful and competent. Since Mayor Sherman’s advent, how different has been the policy.” The above photo shows the Rush Street bridge in 1860. November 3, 1933 – Good news arrives in the city as the Federal Public Works Administration sends an $8,000,000 check to the Chicago Sanitary District as a down payment on the work that must be done in order to meet a U. S. Supreme Court mandate that the city cut its diversion of Lake Michigan water from 10,000 cubic feet per second to 1,500. Another $130,000,000 for the project remains pending. The contract accompanying the allotment runs to 33 pages and will ultimately lead to the employment of more that 3,000 men in the completion of sewer work, primarily on the south and west sides of the city, necessary to make the system ready for the impending drastic reduction in lake water running through the river, the primary system for more than three decades for cleansing the channel. 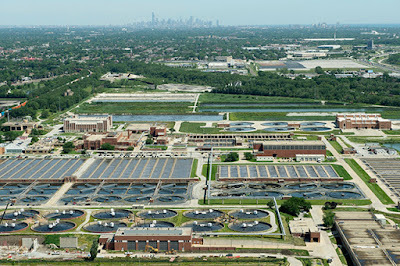 Begun in 1922 the Calumet Sewage Treatment Works, pictured above, was expanded significantly with the money that came from the Federal Public Works Administration.